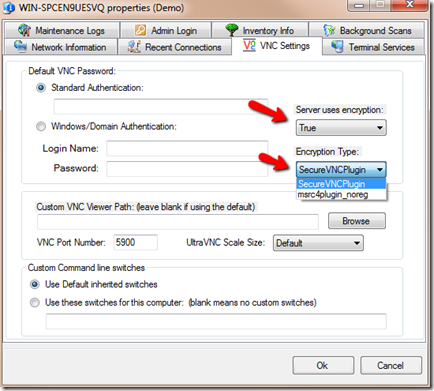 The latest release of VNCScan (2011.3.27) has started the move from the old UltraVNC msrc4plugin_noreg.dsm encryption plugin to the newer and more supported SecureVNCPlugin.dsm. The main reason for this move was the lack of 64 bit support in the old plugin as well as its requirement for a manually generated RC4 encryption key to be shared at both ends of the connection. VNCScan has historically done a pretty good job at making this seamless for our users but it’s a lot of extra work around code that can finally see it’s sunset. If you are currently using VNCScan to deploy UltraVNC with encryption enabled, chances are you’re using the old msrc4 type of encryption. To take advantage of the new higher security, you will need to edit the deployment profile that you used when deploying it the first time or create a new one from scratch. You will, then, need to deploy that new profile to the computers who you want to secure. Here, I will walk you through creating a brand new profile and deploying it to a computer. It is worth pointing out how VNCScan tells the vncviewer.exe to use the encryption plugin while connecting because that is typically the thing that trips people up from time to time. 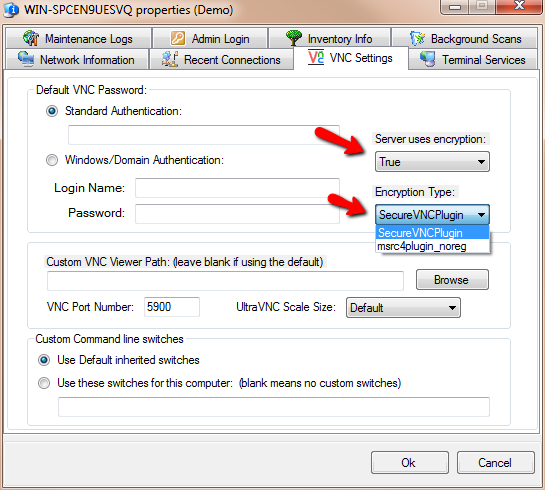 When the deployment tool is completed, it locates the computer in VNCScan and sets some properties for it that can be viewed by right-clicking the computer (in VNCScan) and choosing “Computer Properties”. The most important settings for this to work right are shown below. As you can see, these must match the settings for the deployment profile that you used when deploying. Eventually the MSRC4 plugin will completely go away so you will want to do this to all of your computers soon. Please leave comments and suggestions for these changes below. This entry was posted in howto and tagged 1.0.9, msrc4plugin, SecureVNC, ultravnc. Bookmark the permalink. Which step are you referring to? If you run your vnc vncviewer.exe from a network share, make sure you also copy the plugin files (SecureVNCPlugin.dsm, SecureVNCPlugin64.dsm) to that same network share location.